Luxury homes built in Scottsdale are not exempt from potential roofing problems. Exposure to heavy monsoon rain, triple-digit temperatures, and potentially disastrous haboobs can take its toll on even the most durable roofs. When damage occurs, whether caused by natural sources or excessive wear and tear, finding a dependable, honest, ethical, and proven roofing company who can complete replacement projects on time and within budget is simple when you work with AZ Roofing Works. The leadership team at AZ Roofing Works brings over 47 years of Arizona Roofing experience along with a team of journeyman roofers, tenured project and office managers who proudly serve home owners, commercial property managers, real estate agents and others in Scottsdale. Our dedication to completing high-quality roof repair and replacement services is equaled by our superior customer service. Our team of licensed, insured, and bonded roofing experts focus on quality with every interaction, always act in a professional manner, and complete detailed clean up when we are finished. Tile roofing is quite common in communities such as Gainey Ranch to Ensenada del Oro. Tile roofing is considered to be the most durable of all roofing materials, in some cases lasting more than 50 years. However, eventually they will require replacement. 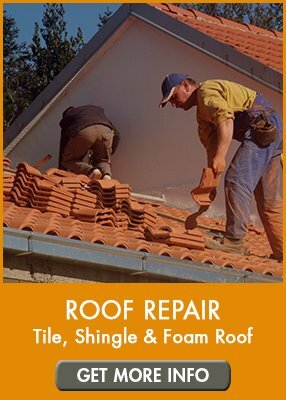 When it’s time for you to replace the tile roof, AZ Roofing Works has the resources and experience to complete your tile roof replacement in Scottsdale quickly and efficiently. We can secure multiple material types of tiles that can be used during roof construction such as concrete, clay, concrete, composite, metal, or Spanish style. We can even mix and match materials to suit your individual taste or HOA compliance. Home that were built more than 20 years ago commonly utilize shingle roofing. Shingle materials including asphalt or polymer shingles are installed in a similar overlapping pattern. However, shingles are much lighter and have a life expectancy about half that of tile. Their lightweight design also makes them prone to damage due to fallen tree branches, blowing wind, lightning strikes and more. 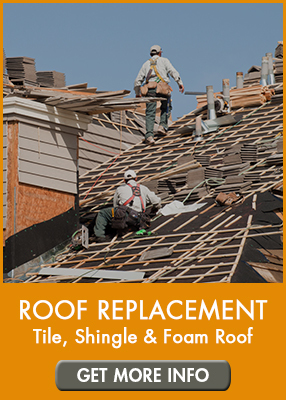 If your shingle roof in Scottsdale is damaged, AZ Roofing Works offers a professional and affordable replacement solution. A flat or foam roof is comprised of several unique materials, ranging from BUR (build-up roof), modified bitumen, foam, and PVC. While they are designed with similar angles and pitch, each material required specific installation and replacement procedures. If you have a home in Continental Village, Andalusia, or Windgate Ranch and have a flat roof that requires replacement, AZ Roofing Works has the experience to complete your flat roof replacement project with precision. 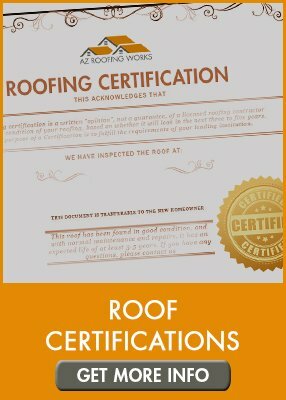 If you are in need of any roof repair service in Mesa, Scottsdale, Scottsdale or any other Metro Phoenix location, AZ Roofing Works is ready to help you! Contact us today, either online or call our office directly at (602) 283-3383.